Happy Tuesday! I am back up and running (my computer that is). We have been having some issues with our router (ARGHHH! I hate being without the Internet!!!! I feel so disconnected). Anyway, I hope you had a terrific weekend. I had some time to finish up my class assignment, so now I am ready for this weeks assignment (I am really bummed that this is the final week of the class). This week we are learning how to extract a picture from it's background...sounds kinda complicated, but I am up for the task! I was supposed to take some photos for my Saturday assignment (which I will need for my layout this week),but no one in my family wanted to be the subject of my photo shoot...I wonder why? Probably because I have to take lots of pic's before I get one I like, lol! I did get some stamping in...I needed to make a few birthday cards and a thank you. Today's card is for my step mom, her birthday is next week. I used the set Butterfly Kisses by Papertrey. I haven't used this set in quite a while, so it was kind of fun re-discovering it. I cut out a butterfly image and popped it up with a dimensional, so it looks like it is ready to fly off the card. 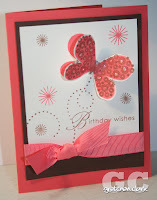 I am also really loving the new Papertrey Perfect Match Collection, the Berry Sorbet is such a yummy color. I just ordered the new colors that debuted on 4/15 (but don't tell Mike! lol! ).